If you missed the not-so-subtle hint in yesterday’s “Should I purchase the Wailing Wall?” post, logging-in to play the game today will clue you in. You’ll automatically be prompted with some text, after which you’ll receive your free gift. No, it isn’t the rumored (REDACTED), that may just end-up being content from a future update, possibly the next level. You shouldn’t be too disappointed though. The rumor that we would be getting a free gift was at least true. How do you feel about this free gift? Are you happy to have some premium content for free? Upset because you already purchased one? Disappointed it isn’t something more unique? Let me know in the comments. Think of this way. When you go trick-or-treating you aren’t always going to like the candy that is given to you, but at least it is free. There are some players that are reporting a glitch with the Squidport that actually appears to be beneficial. It has to do with building tiles. Apparently, it is not in your best interest to immediately collect newly built boardwalk tiles. Instead try to get your friends to tap on them. The typical handshake symbol should appear over the title, and when your friends tap on it they should receive a nice XP bonus. On your end, the glitch will lead to stacked tiles. Meaning for each friend who taps on the tile, another will stack on top of it. For some people this is not the case. In some instances if a friend taps on a tile before you collect it, you could lose it. It is up to whether or not you want to take the gamble with this glitch. This glitch might be a blessing in disguise for those of you who are struggling to make progress on building the Squidport. However because it is a glitch, it may not be wise to abuse it, just in case there are repercussions down the road. Should I purchase the Wailing Wall? The Wailing Wall is one of the few pieces of content that you can buy to generate ghosts. These will only be available for a limited-time, so you only have a week left to decide if you want to add this decoration to your town. If you’re on the fence about whether or not you want the Wailing Wall, take a day to think it over. You’ll be glad you did, trust me. For EA, donuts are as good as gold. That’s a lot of dough(nuts)! We knew that this game was making Electronic Arts money, but now we have an idea of just how much! Yes, a game that is completely free-to-play and has no upfront costs has made the company $100 million dollars since its launch a little over a year ago. To put that in perspective, Dunkin’ Donuts, a company that profits by selling actual donuts reported similar profits last year. Does that mean our donut consumption in-game mimics what happens in the real-world? Not exactly, there are numerous other factors to consider which include, but are not limited to production costs and the associates expenses of these two very different companies. Still though, it is an amusing tidbit of information. Considering how profitable the game is, it is safe to say that The Simpsons: Tapped Out will be around for quite some time. Especially since the show was renewed for a twenty-sixth season, making it all the more likely that there will be plenty of cross-promotional updates in the future. 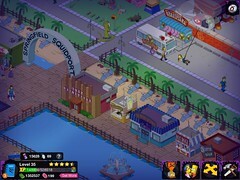 The Simpsons™: Tapped Out eclipsed $100 million* in life-to-date digital net revenue, and has been in the top 20 iPhone grossing games in the U.S. for all but 12 days, since launching in August 2012. So the outlines idea I proposed earlier today seems to have gone over remarkably well. It will take time to expand this new section of the site, which can now be access in the tab above. So far I’ve only managed to get a page for Level 36 posted, and a work-in-progress page covering the Treehouse of Horror XXIV. Needless to say this is another huge undertaking, but in the end it will be worth it to the overall relevance of the site. For the next few days I’ll be working on the back-end of the site to get these reference guides up and running. Unfortunately that means there will be a lull in some of the more fun and engaging posts during that time. So it might be a while until I get an opportunity to post another “What have you done with…” post. In the mean time, please like the site on Facebook and follow the site on Twitter for the latest updates if you haven’t already. This isn’t just the best blog covering The Simpsons: Tapped Out, but it also has the best community. Thanks as always for the feedback and for the engaging discussions in the comments. Last week I added a spoiler-lite walkthrough, and this idea was well-received. However in reviewing the post I thought there was something about the formatting that could be improved. So I went to work on something a little easier to understand, and started work on an outlines page. Which version do you prefer? My thoughts is that the outlines page is easier to read, as you can easily see at a glance the characters that are involved and how long they’ll be occupied with any given task. Right now the page only shows one quest line. If the concept is well-received I’ll begin working on adding more content. In time this could be a great reference page for those who want to get a bit of an outline, without getting spoiled on all of the dialogue. No deal! You can’t sell these. There are quite a few items in the game, that once you acquire them, you’re stuck with them forever. Typically limited-time content is protected, but this is not always the case. Below I’ve listed the items you cannot sell, followed by a chart showing a list of the limited-time items you can sell. Hopefully these endangered items will become protected at some point too. There does not appear to be any reason to why certain items are protected, while others are not. The episode “In Marge We Trust” introduced one of the most iconic mascots in the history of the show, Mr. Sparkle. This Japanese dishwashing detergent can even be seen in the opening sequence when Marge is checking out of the grocery store. A majority of the episode focuses on one of the more ancillary characters of the show, Rev. Lovejoy. The whole Mr. Sparkle adventure is really just the B story of the episode, and it turned out to be the most iconic. So would you like to see Mr. Sparkle added into the game in some form? It would be a good excuse to add some more Japanese-styled buildings and decorations to the game. Wouldn’t it be nice to have some cherry blossom trees alongside all of the greenery? We already have Three-Eyed Sushi on the boardwalk and the Swanky Fish restaurant, so maybe some more Asian influences would give players a chance to build another district to their Springfield. Springfield has transformed from a humble town into a bustling city, but is that for the better? New buildings and characters are constantly being added to the game. It can be a nightmare trying to find the person you are looking for on the ever expanding map. When is too much content a bad thing? So many long-time players are just sitting at the level cap trying to squeeze all of this content into one space. Right now there are no easy ways to redesign your town. If you want to wipe the slate clean, you’re going to have to place everything into storage bit-by-bit. You could try to shuffle things around if you have some free space, but it’s not always that easy. Either way you choose to approach this task, it’s going to be a huge, carpal tunnel inducing project that will take several hours to complete. Finding characters has also turned into a chore. It used to be fairly easy, but if you’ve purchased all the available land it may take several sweeps to find who you are looking for. Don’t you think it’s about time a character locator was added to the game? When you start a new account, it really puts things into perspective about how much work you need to do in order to progress through the game. One common misconception is the importance of your current level. Some buildings remain locked until you reach a certain level, but you also have to complete quests to trigger the construction of certain buildings. This chart showing the build order displays a variety of information. You’ll get an idea of the level you need to reach before you can construct these buildings, as well as how much they cost. You may be wondering why you can’t build the Gilded Truffle when you’re at level 18, when the Gilded Truffle only requires level 16. Well if you haven’t even built the Android’s Dungeon, a level 13 building, you still have a ways to go. Think of each building on this list as a stair, you can’t get to the next step by jumping. Everything has to be done one step at a time. There may be some wiggle room, as certain characters trigger quests to construct new buildings. For example, if Homer is needed to set off a build quest, and you have him running around doing all sorts of Halloween quests, you might be a bit behind.